Among the services that BridgeEnglish offers is language testing. Students can choose between the IELTS , the TOEIC and the iTEP, depending on their needs and requirements. Which test is right for you? Find out by checking out the rubric below! BridgeEnglish has offered the IELTS test (International English Language Testing System) since March of 2008. Starting with just one test per month, we have expanded our test availability to three tests per month and now offer off-site testing through our partner, the University of Northern Colorado at their extension classroom campus at Loveland, Colorado. Who’s it for? Developed by Cambridge University and its partners, the IELTS is quickly becoming the test of choice for individuals preparing to enter college or university in the U.S. and needing to show their English proficiency level. It’s also used by individuals planning to immigrate to Canada, Australia, New Zealand or the U.K. to demonstrate their English proficiency. What’s it like? The test consists of listening, reading and writing sections and a speaking section. The latter is done with a trained Cambridge-certified test examiner rather than via a computer. The writing test is also graded in Bridge by a test examiner to Cambridge’s strict standards and the Cambridge rubric which is used at IELTS centers throughout the world. As do our IELTS partners, we emphasize customer service and speedy test results now available online. How to register: Registration is available online or through walk-ins in our main building. BridgeEnglish now ranks as the 5th largest IELTS testing center in the U.S.
Who’s it for? Developed by Educational Testing Services, the TOEIC determines the listening and reading skills level especially for the business person, company employee or member of an organization. What’s it like? This is a paper and pen test and is offered one time per month. The TOEIC Listening & Reading Test is a two-hour multiple-choice test consisting of 200 questions evenly divided into listening comprehension and reading comprehension. The TOEIC Speaking & Writing Test was introduced in 2006. Test takers receive separate scores for each of the two tests, or can take the Speaking test without taking the Writing test. The Speaking test assesses pronunciation, vocabulary, grammar, and fluency, while the Writing test examines vocabulary, grammar, and overall coherence and organization. The tests are designed to reflect actual English usage in the workplace, though they do not require any knowledge of specialized business terms. How to register: Registration is available online at the ETS website only. Our newest offering, the iTEP (International Test of English Proficiency) will be launched later in the spring of this year. Who’s it for? 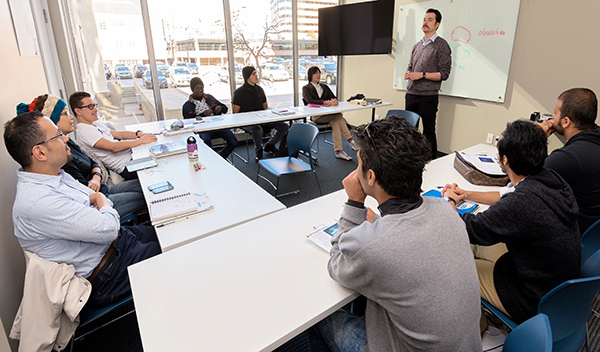 We will be featuring the Business iTEP initially for our executive students as they can take it here in Denver and also at our Latin American centers to get a continuous check of their progress in English. What’s it like? The iTEP (International Test of English Proficiency) is available in paper and pen version or online and consists of listening, reading, speaking and writing components. How to register: Online or onsite at Bridge. esl-blog, Tests and Evaluations English language proficiency tests, ielts, itep, toeic. permalink.